Taking part in a lottery game can be enjoyable if a player knows the tricks to secure a winning combination. Some players, on the other hand, tap on the expertise of other players, while some prefer to operate the game rather than playing. Nonetheless, lottery negotiations and conditions which are agreed by a group must be written and signed in order to make the agreement legally binding. What Is a Lottery Agreement Form? A lottery agreement form is a document to be made and be signed by individuals involved in a lottery event or draw. The form will define the agreed terms and conditions to be observed by the parties of the agreement. In addition, when making the form, all involved parties should contribute their thoughts, concerns, and ideas to arrive at a finalized document. 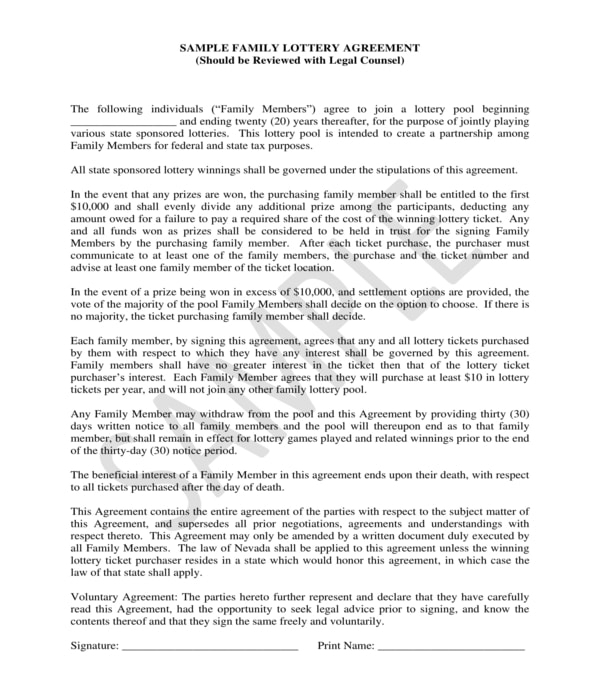 Family Lottery Agreement Form – This lottery agreement form is intended to be signed by family members whose plan is to participate in a lottery game for a specified number of years as a group. In the form, the start and end dates for the period of participation will be stated along with the amount to be given by the family member who picked the winning lottery combination. Each family member who will be participating and take part in the agreement must enlist their names and affix their signatures at the signature block of the form. In addition, there is also a voluntary agreement declaration statement which is for documenting that the parties who signed the form have done it with their full will or voluntarily. 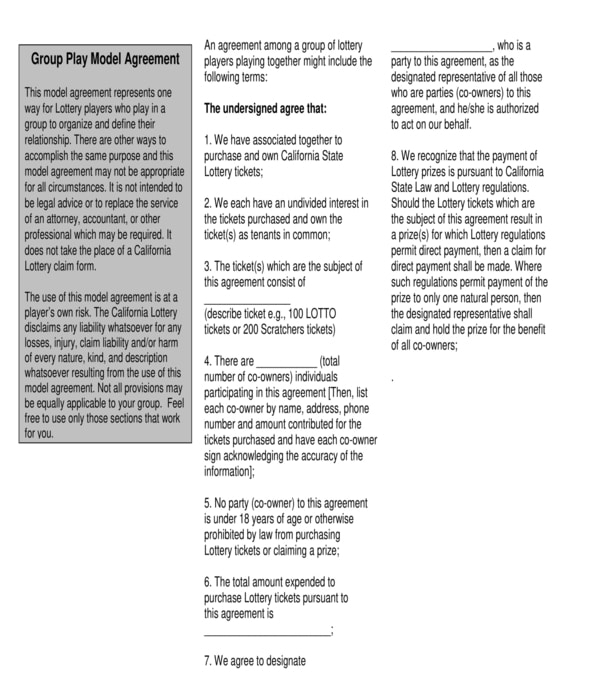 Lottery Group Play Model Agreement Form – If the group players of a lottery game are not blood-related folks or not members of one family, then a lottery group play agreement form is the form to use for laying out the terms and conditions to be agreed prior to playing a lottery game. The form contains eight items that the group members must agree on. The first item will be for stating the type of lottery to be played by the group which will then be followed by the roles of the group members. The third item listed in the form will indicate the description and the number of lottery tickets to be purchased per game, while the fourth item will discuss the co-ownership of the tickets. The eligibility of each member is the focus of the fifth item in the form. The sixth item, on the other hand, will disclose the total amount expected to be used in purchasing the lottery tickets, while the last two items of the form will explain the designation and the payment requirements to be met by each member. 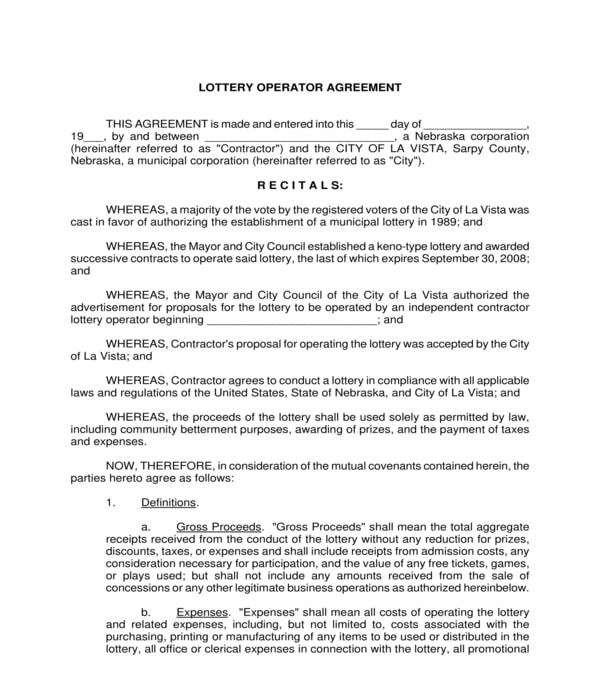 Lottery Operator Agreement Form – The parties in this agreement are the contractor and the government or the City who will provide the lottery machines and materials. This variety of lottery agreement is legally binding and is acknowledged by the State which means that there is a need for a notary public or an attorney to verify, validate, and notarize the form. Basically, a lottery operator agreement form will bind the contractor who will be managing the lottery games, to the City where the lottery will take place. The rights and duties of the contractor, as well as the importance of record-keeping and auditing, and advertising and promoting the lottery games, are all specified in the lottery operator agreement form. Additionally, there are also sections for documenting the agreed number of hours for the lottery games, and the payment responsibilities of the involved parties of the agreement. Lottery Scholarship Consortium Agreement Form – There are States and countries who use lottery games for funding individuals who are in need of financial aid assistance. One of the known programs that lottery organizations offer is a scholarship program for eligible students. 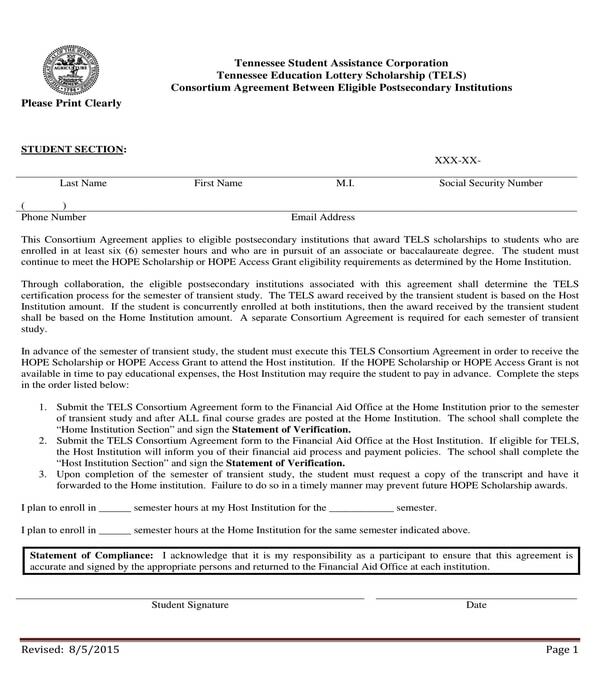 For this, a lottery scholarship consortium agreement form is to be used by the student who plans to apply as a scholar or a beneficiary of the program. The form will collect the name of the student applicant and his contact information, as well as the details of his enrollment and the course that he will be taking. 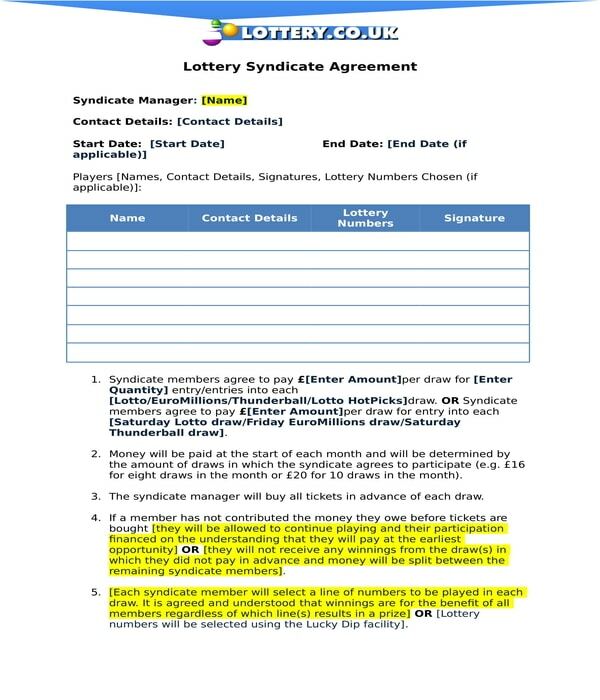 Lottery Syndicate Agreement Form – This form variety is suitable to be used by any type of group, either the members are relative, friends, or just colleagues at work. The purpose of a lottery syndicate agreement form is to document the members with their roles and responsibilities throughout the term of the agreement. The first section of the form will state the name of the syndicate manager and his contact details. The manager is the person assigned to handle the group such as conduct meetings and negotiations for a lottery game. The succeeding sections of the form will enlist the names of the syndicate members, their contact information, their lottery numbers, and the rules and regulations to be mandated. 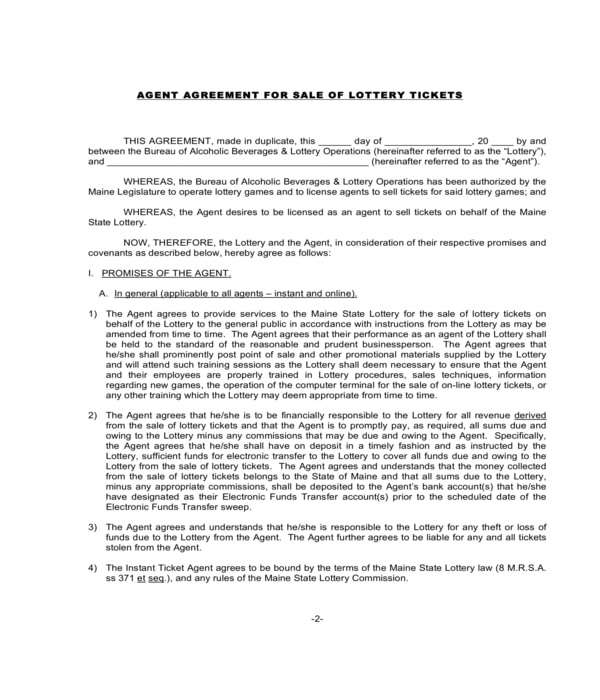 Lottery Ticket Sale Agent Agreement Form – If the intent of an individual is to be a lottery agent whose responsibility is to sell lottery tickets, then he must sign a lottery ticket sale agent agreement form with the ticket provider. The form will discuss the promises of the agent, the provisions to be observed for the lottery clients, and the liabilities of the agent. In order to complete the form, the agent must state the name of his company or business where the tickets will be sold along with his and a witness’s signature, and the approval of the ticket providers. Why Are Lottery Agreement Forms Important? There are tons of reasons why lottery agreement forms are essential to be made and be signed by a group, or two parties, who agreed to partner in a lottery activity. However, the most common reason is simply to document what had been agreed on. With a lottery agreement form, each party will have his own guide from the beginning to the end of the agreement period. In addition, the form will also hold each involved party accountable for their actions, especially when one member has won using his listed combination. The form ensures that any future dispute, specifically financial issues, and concerns, will be addressed and be resolved immediately without any delay.